Indagare is proud to unveil our magazine featuring the best of fall and winter travel in the 2018-19 season. 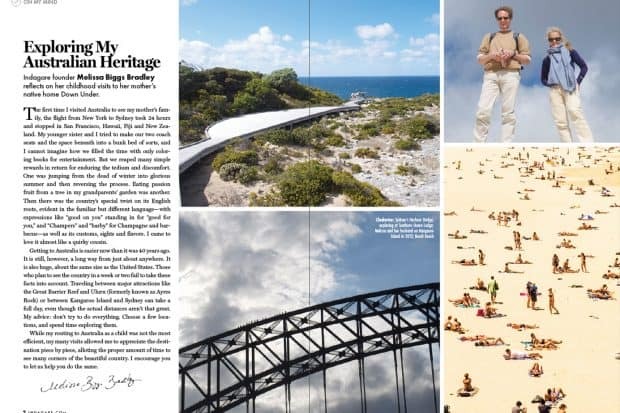 Indagare is proud to unveil our redesigned magazine, featuring the best of spring and summer travel. Indagare’s guide to the best of Active & Adventure Travel, including articles on the best hikes, adrenaline-pumping adventures, glamping and more. Plus: New York City dining spotlight, the Seychelles and more. 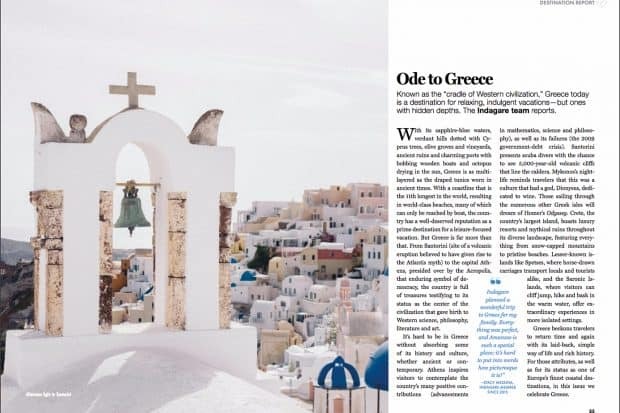 Indagare’s guide to the best of Greece, including articles on the best islands, itineraries by boat, interviews with local experts and more. Plus: Provence’s luxe new retreat, the best surfing spots and more. 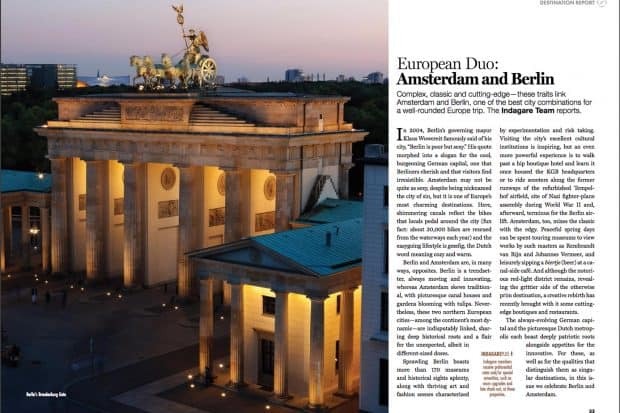 Indagare’s guide to the best of Berlin and Amsterdam, including a lay of the land, the best hotels, Q&As with local style and culinary experts and more. Plus: Iceland’s stunning five-star retreat, healthy travel tips and more. Indagare’s guide to the best of summer family travel, including articles on multigenerational travel, where to take your kids when they are toddlers and teenagers and more. Interested in purchasing a Black Book Magazine? Contact Indagare for more information. Indagare’s guide to the best of Austria, including a lay of the land, the best hotels, Q&As with local style and culinary experts and more. Plus: Mexico’s best beaches resorts, nine reasons to plan a trip to Portugal and more. 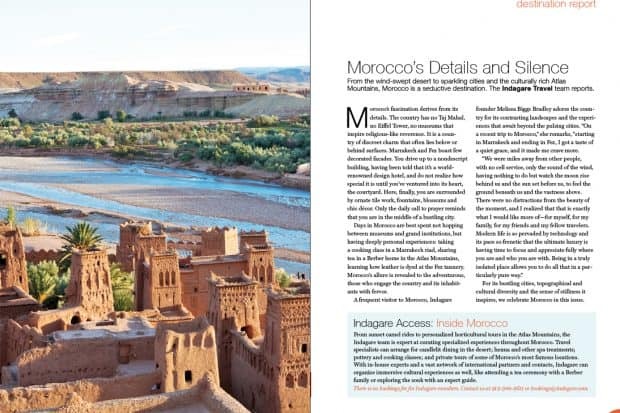 Indagare’s guide to the best of Morocco, including a lay of the land, the best hotels, a Q&A with Marrakech expert Madeline Weinrib and more. Plus: Six up-and-coming destinations, the perfect itinerary for a weekend in Austin and more. 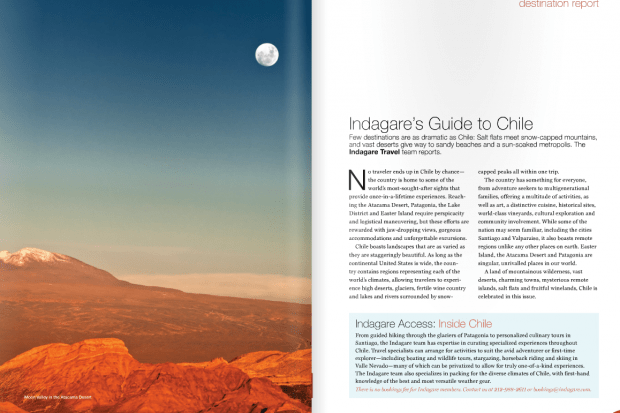 Indagare’s guide to the best of Chile, including a lay of the land, tips for planning a trip to Patagonia and the Atacama desert and a spotlight on a high-design property in the winelands. 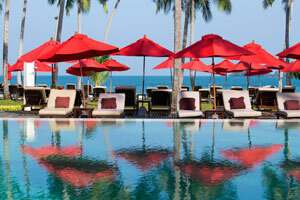 Plus: A guide to Sri Lanka and Q&A with a Rome insider. 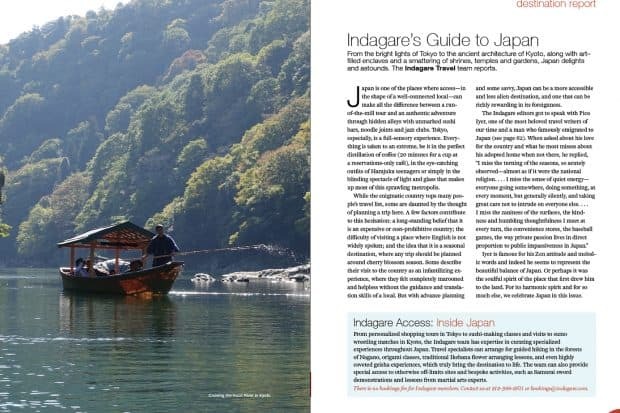 Indagare’s guide to the best of Japan, including a lay of the land and the best hotels, restaurants and shops in Tokyo, Kyoto and beyond, and an interview with Pico Iyer. Plus: Nantucket news and an essay on gorilla trekking. 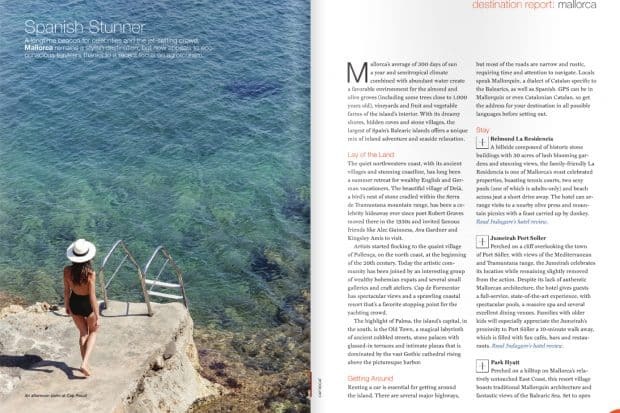 Indagare’s guide to the best of Capri, Corsica, Mallorca and Sardinia, including a lay of the land and the best hotels, restaurants and shops in each destination. 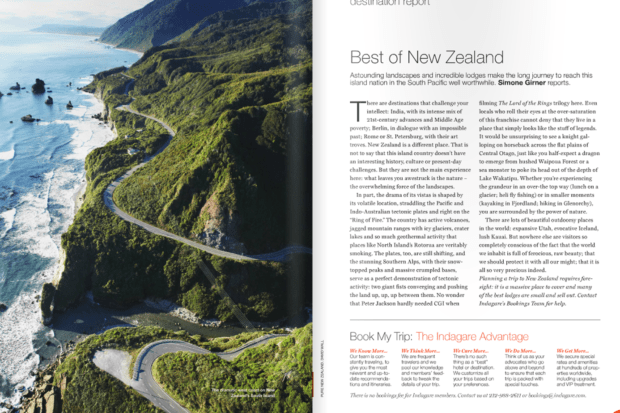 Plus: Indagare’s iconic New Zealand honeymoon itinerary. 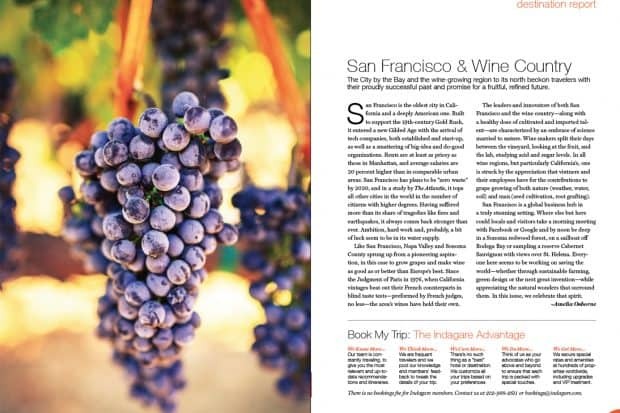 Indagare’s guide to the best of San Francisco, Napa Valley and Sonoma, including a lay of the land, the best hotels, restaurants and shops in each destination and which vineyards to know about. Plus: A mapped-out road trip through Sonoma. Indagare celebrates the best of travel, including our Indagare Adored properties for 2015; itineraries for Paris and Sicily and our most-booked hotels of the year. Plus: a comparison between some of Africa’s top safari destinations. 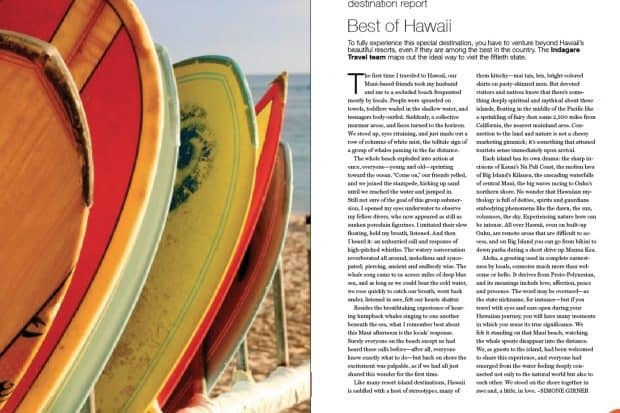 Indagare’s guide to the best of Hawaii, including the state’s lay of the land, reports on the main five islands, which films to see before you go and a ten-day itinerary for families. Plus: An essay about a memorable trip by Indagare’s Simone Girner. Indagare’s guide to the best of New Zealand, including the country’s lay of the land, reviews of the top lodges, which wine regions to know about and a three-day itinerary for Queenstown. Plus: A comparison of some of New Zealand’s most unique properties. 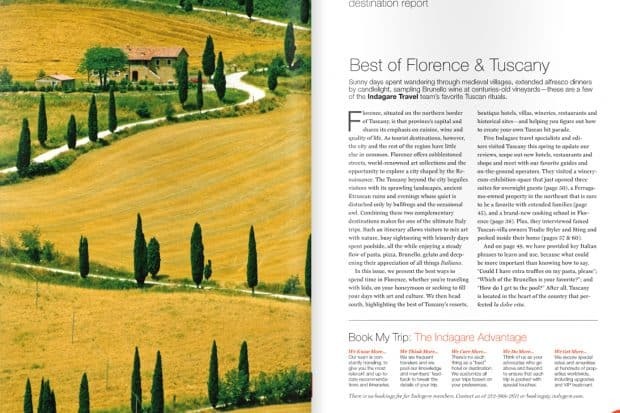 Indagare’s guide to the best of Florence and Tuscany, including a lay of the land, itineraries for the best road trips, which vineyards to know about and our favorite villa rentals in the region. 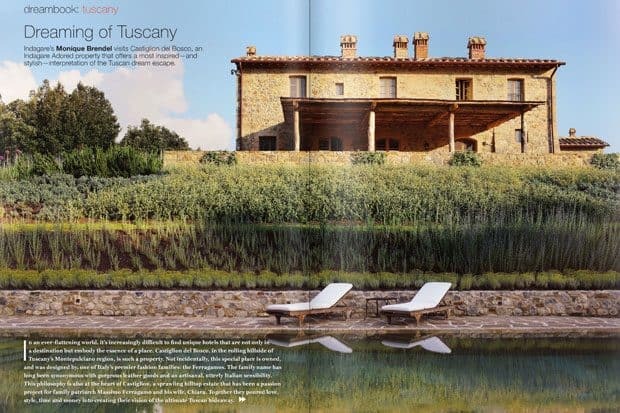 Plus: A Q&A with Sting and Trudie Styler about their Tuscan home. 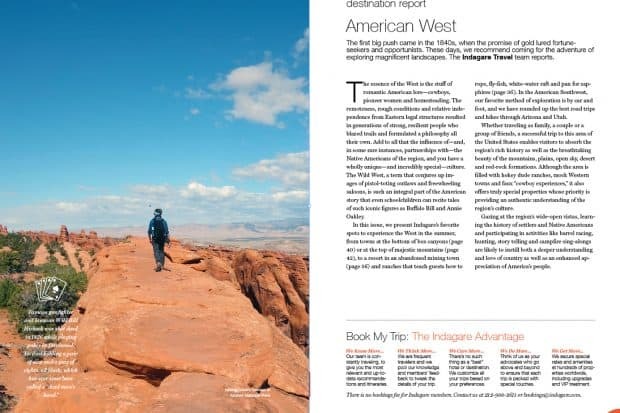 Indagare’s guide to the best of the American West, including a lay of the land, itineraries for the best road trips, what to know about the Grand Canyon and mini destination reports for Aspen and Jackson Hole. Plus: A comparison of the best dude ranches. 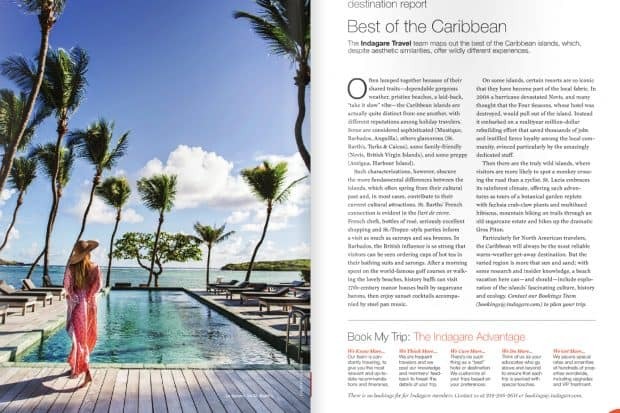 Indagare’s guide to the best of the Caribbean, including a lay of the land, reviews of the top resorts for families, the best private islands and a recap of Anguilla’s properties (including a stunning newcomer). Plus: 2015’s most exciting Caribbean hotel openings. 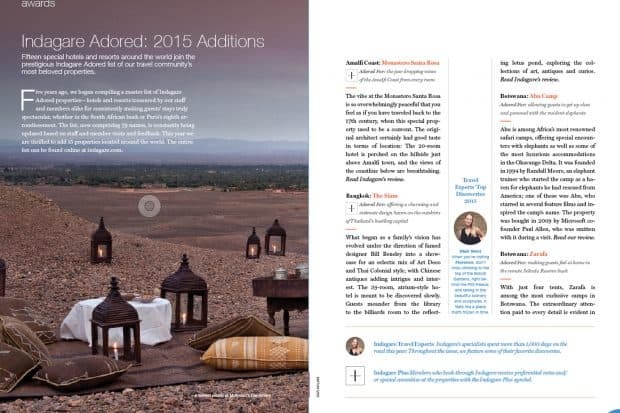 Indagare celebrates the best of travel, including our Indagare Adored properties for 2014; great itineraries for Chile and Iceland; our most-booked hotels of the year and and a look at our website’s new functionality. 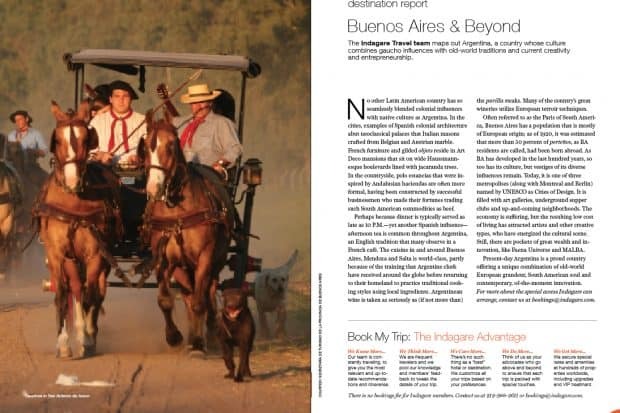 Indagare’s guide to the best of Argentina, including the country’s lay of the land, reviews of the top hotels and resorts, the best of artisan shopping and a spotlight on the best wine regions. Plus: Indagare’s Argentina reading and viewing list. 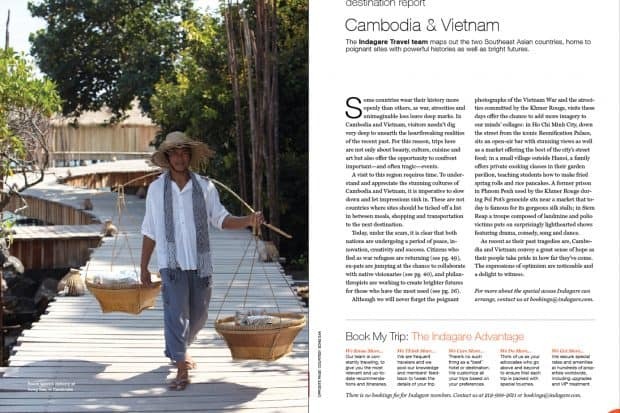 Indagare’s guide to the best of Cambodia and Vietnam, including the countries’ lay of the land, reviews of the top hotels and resorts, the best of shopping and a spotlight on a worthwhile charity. Plus: Indagare’s Cambodia and Vietnam reading and viewing lists. 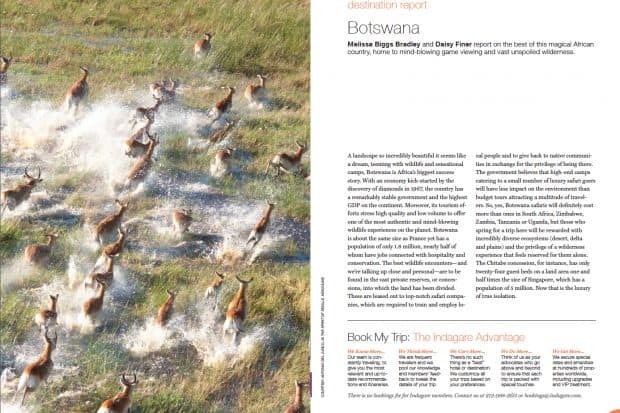 Indagare’s guide to the best of Botswana, including the country’s lay of the land, reviews of the top camps, answers to frequently asked questions, interviews with experts and a recommended packing list. Plus: Indagare’s Botswana reading and viewing list and camera and photography recommendations. 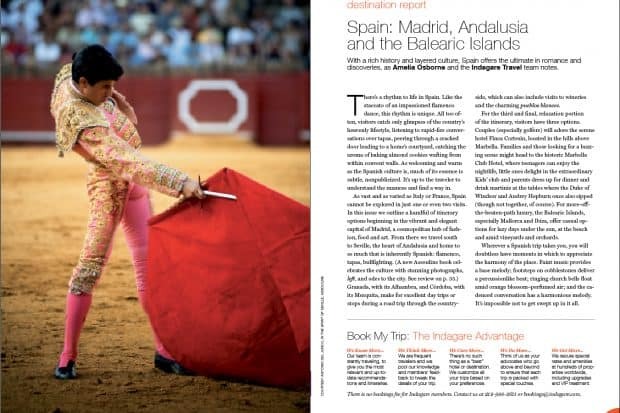 Indagare’s guide to the best of Madrid, Andalusia and the Balearic Islands, including cheat sheets on the best destinations, reviews of the top hotels, great restaurants, the stores not to miss and the top sights. Plus: special Indagare tours, a look at two favorite Marbella area hotels and top picks on Ibiza. 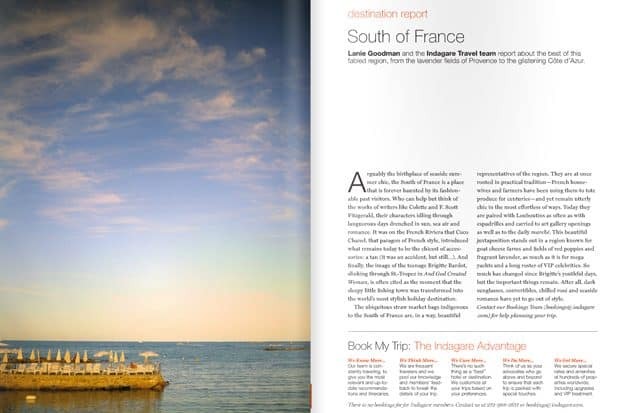 Indagare’s guide to the best of the South of France, including cheat sheets on the best destinations, reviews of the top hotels, great restaurants, the stores not to miss and the top sights. Plus: special Indagare tours, a look at a new Provence property and your French reading and viewing list. 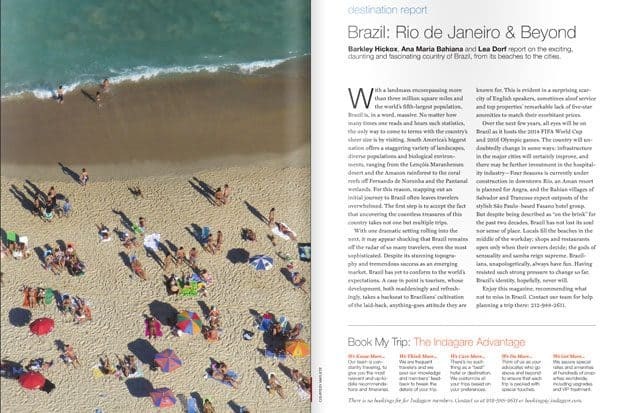 Indagare’s guide to the best of Brazil, including cheat sheets on the best destinations, reviews of the top hotels, great restaurants, the stores not to miss and the top sights. Plus: what other spots to not to miss, including beach locales Bahia and Buzios, a contemporary art Mecca and the Amazon. 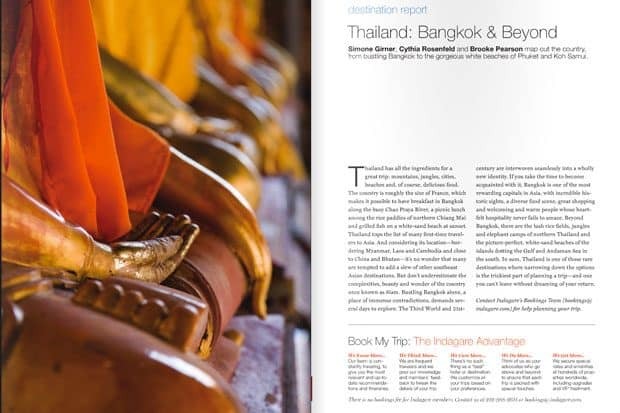 Indagare’s guide to the best of Thailand, including cheat sheets on the best destinations, reviews of the top hotels, great restaurants, the stores not to miss and the top sights. Plus: what books to read and movies to watch to prepare for a trip to Thailand, and information on how to add on a few days in a neighboring country. 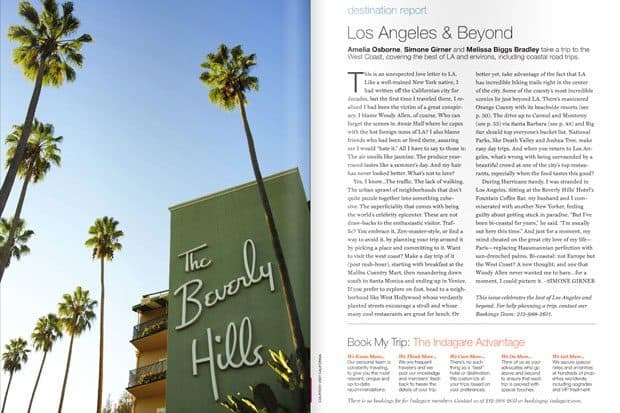 Indagare’s guide to the best of Los Angeles, including reviews of the top hotels, great restaurants, the stores not to miss while in the city, and the top sights. Plus: family-friendly resorts in the O.C. and romantic enclaves in the Santa Barbara area, a road trip along the Pacific Coast Highway and Indagare’s favorite California spas. 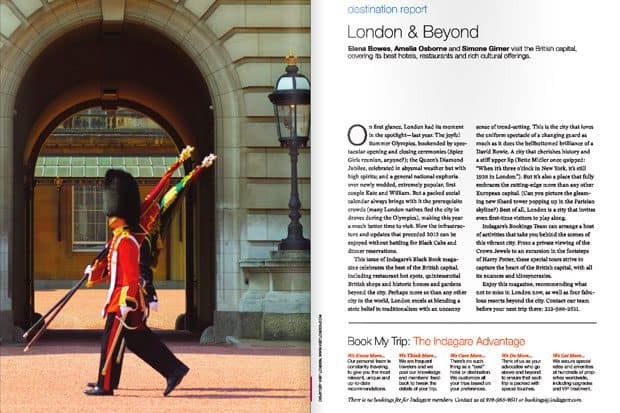 Indagare’s guide to the best of London, including reviews of the top hotels, great restaurants by neighborhood, the stores not to miss while in the city, and the top sights. Plus: Insider access to some of the capital’s most historic places and an interview with interior designer Kit Kemp. 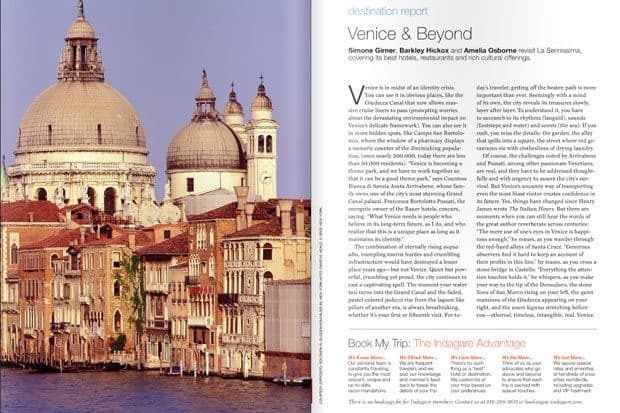 Indagare’s guide to the best of Venice, including reviews of the top hotels, authentic restaurants and itineraries for classic and in-depth Venice. Plus: Unique places to explore beyond Venice: Lake Como and Garda, Cortina d’Ampezzo and cruising the Adriatic. 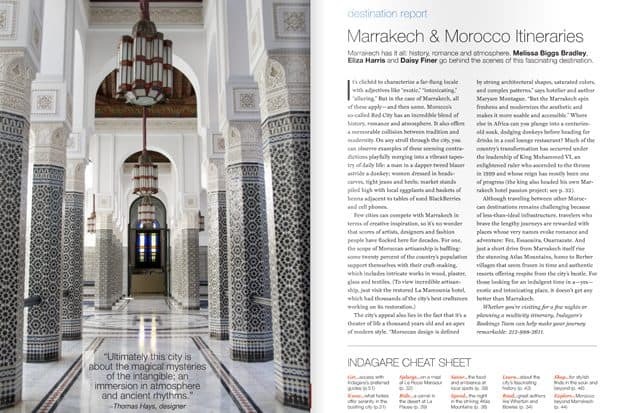 Indagare celebrates the best of travel, including our Indagare Adored properties for 2012; great itineraries for Italy, South America, Morocco and South Africa; the best newcomers of last year and a look at the most-anticipated hotels and resorts to open in 2013. Plus: reports on Berlin, Tuscany, Fiji and Myanmar. 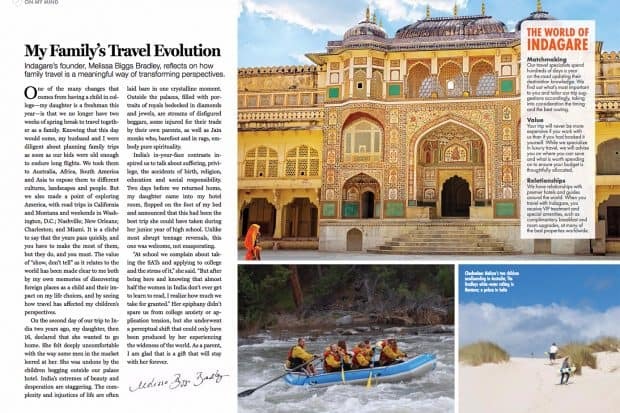 Indagare’s guide to the best of India, including cheat sheets on Delhi, Agra, Jaipur, Jodhpur and Udaipur; a shopping guide to Mumbai; and dispatches from Kerala and a wellness retreat in the Himalayas. 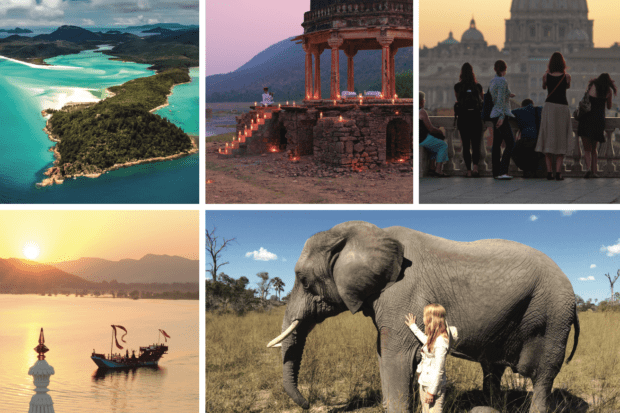 Plus: book reviews, unique hideaways and tips on how to craft the ultimate India itinerary. Indagare’s guide to the best of South Africa, including top hotels and authentic local restaurants and boutiques in Cape Town. 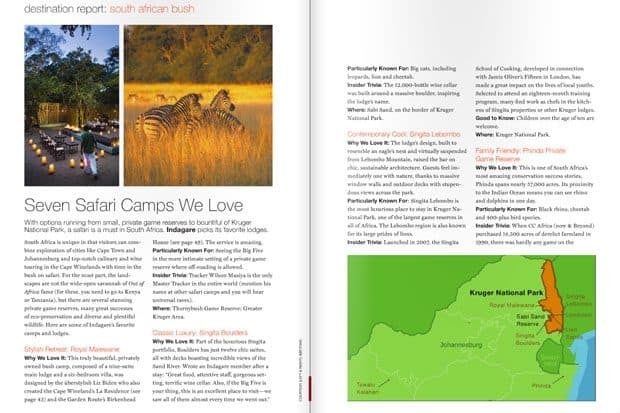 Plus: Favorite safari lodges and itineraries in the Cape Winelands and along the Garden Route. 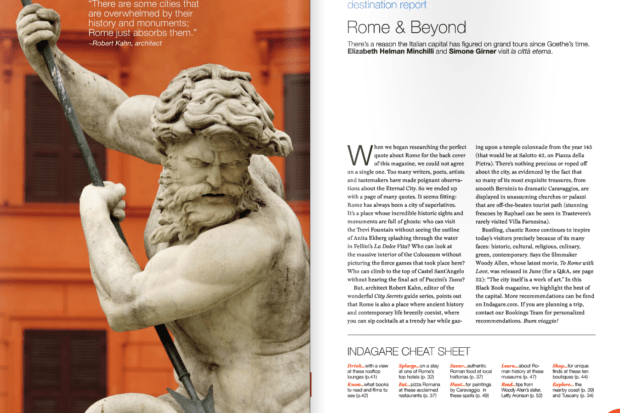 Indagare’s guide to the best of Rome, including top hotels nad sights, as well as an extensive reading and viewing list. Plus: Insider picks from stylish locals and five iconic Italian resorts where to relax post city exploration. 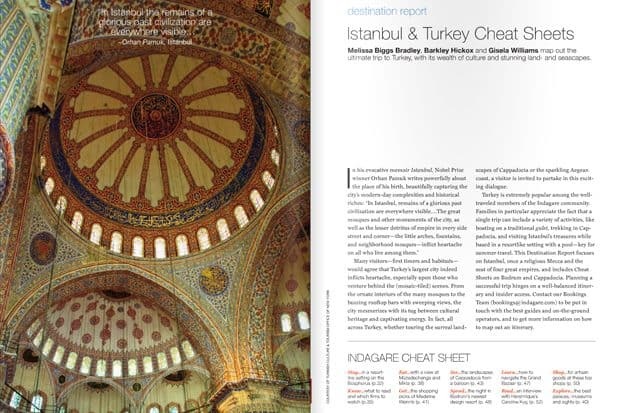 Indagare’s guide to the best of Istanbul, including top hotels, authentic local restaurants and boutiques, as well as an extensive reading and viewing list. 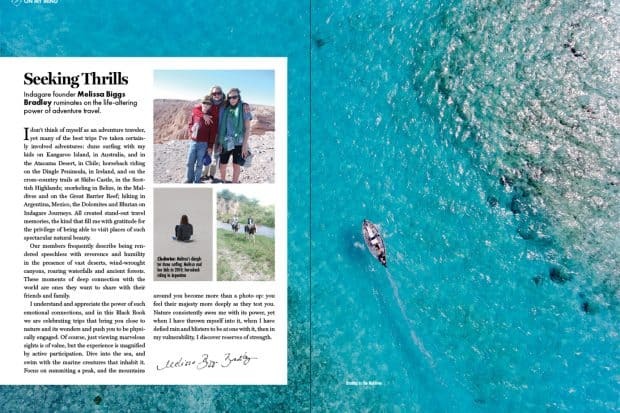 Plus: Cappadocia and Bodrum itineraries, info on how to rent a Turkish gulet and interviews with stylish locals who share their favorite secret addresses. 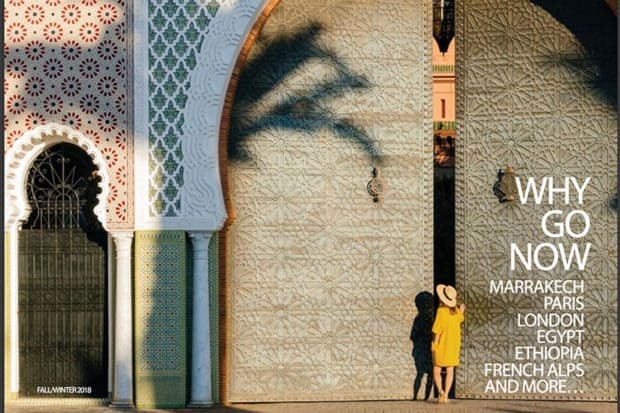 Indagare’s guide to the best of Marrakech, including hotels, restaurants and boutiques, as well as tips on Morocco’s other captivating destinations (Atlas Mountains, Fez and more). 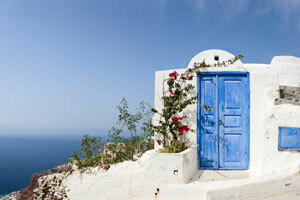 Plus: interviews with stylish locals who share their favorite secret addresses.